The Curious Wavefunction: How it came from bit: Review of George Dyson's "Turing's Cathedral"
How it came from bit: Review of George Dyson's "Turing's Cathedral"
The physicist John Wheeler who was famous for his neologisms once remarked that the essence of the universe could be boiled down to the phrase "it from bit", signifying the creation of matter from information. This description encompasses the digital universe which now so completely pervades our existence. Many moments in history could lay claim as the creators of this universe, but as George Dyson marvelously documents in "Turing's Cathedral", the period between 1945 and 1957 at the Institute for Advanced Study (IAS) in Princeton is as good a candidate as any. The title is somewhat misleading. 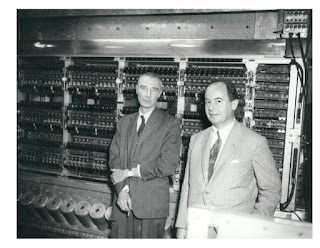 Dyson's book focuses on the pioneering development of computing during the decade after World War II and essentially centers on one man- John von Neumann; lover of fast cars, noisy parties and finely tailored suits (as the photo above shows, he shared this sartorial taste with IAS director Robert Oppenheimer). A man for whom the very act of thinking was sacrosanct, Von Neumann is one of the chosen few people in history to whom the label "genius" can authentically be applied. His central talent was an unsurpassed ability to take apart any problem from any field and put it back together so that the answer was usually staring you in the face. The sheer diversity of fields to which he made important contributions beggars belief- Wikipedia lists at least twenty ranging from the mathematical foundations of quantum mechanics to game theory to biology. As one of the IAS's first permanent members, his mind ranged across a staggeringly wide expanse of thought, from the purest of mathematics to the most applied nuclear weapons physics. Dyson's book recounts the path breaking efforts of von Neumann and his team to build a novel computer at the IAS in the late 1940s. Today when we are immersed in a sea of computer-generated information it is easy to take the essential idea of a computer for granted. That idea was not the transistor or the integrated circuit or even the programming language but the groundbreaking notion that you could have a machine where both data AND the instructions for manipulating that data could be stored in the same place by being encoded in a common binary language. That was von Neumann's great insight which built upon the idea of Alan Turing's basic abstract idea of a computing machine. The resulting concept of a stored program is at the foundation of every single computer in the world. The IAS computer practically validated this concept and breathed life into our modern digital universe. By present standards its computing power was vanishingly small (as Dyson poignantly puts it, there were a total of 53 bytes of memory in the world in 1953), but the technological future it unleashed has been limitless. The one thing that von Neumann got wrong was that he envisioned computers getting bigger and bigger, but apart from this miscalculation he seems to have seen it all. Dyson's book excels mainly in three ways. Firstly, it presents a lively history of the IAS, the brilliant minds who worked there and the culture of pure thought that often looked down on von Neumann's practical computational tinkering; it describes the pure mathematicians' "undisguised horror" at a bunch of engineers getting their hands dirty with real machinery at so close to their offices. Secondly, it discusses the provenance of von Neumann's ideas which partly arose from his need to perform complex calculations of the events occurring in a thermonuclear explosion. These top-secret calculations were quietly run at night on the IAS computer and in turn were used to tweak the computer's workings; as Dyson pithily puts it, "computers built bombs, and bombs built computers". Von Neumann also significantly contributed to the ENIAC computer project at the University of Pennsylvania. Thirdly, Dyson brings us evocative profiles of a variety of colorful and brilliant characters clustered around von Neumann who contributed to the intersection of computing with a constellation of key scientific fields that are now at the cutting edge. There was the fascinating Stan Ulam who came up with a novel method for calculating complex processes - the Monte Carlo technique - that is used in everything from economic analysis to biology. Ulam who was one of the inventors of thermonuclear weapons originally used the technique to calculate the multiplication of neutrons in a hydrogen bomb. Then there was Jule Charney who set up some of the first weather pattern calculations, early forerunners of modern climate models. Charney was trying to implement von Neumann's grand dream of controlling the weather, but neither he nor von Neumann could anticipate chaos and the fundamental sensitivity of weather to tiny fluctuations. Dyson's book also pays due homage to an under-appreciated character, Nils Barricelli, who used the IAS computer to embark on a remarkable set of early experiments that sought to duplicate evolution and artificial life. In the process Barricelli discovered fascinating properties of code, including replication and parasitism that mirrored some of the great discoveries taking place in molecular biology at the time. As Dyson tells us, there were clear parallels between biology and computing; both depended on sequences of code, although biology thrived on error-prone duplication (leading to variation) while computing actively sought to avoid it. Working on computing and thinking about biology, von Neumann anticipated the genesis of self-reproducing machines which have fueled the imagination of both science fiction fans and leading researchers in nanotechnology. Finally, Dyson introduces us to the remarkable engineers who were at the heart of the computing projects. Foremost among them was Julian Bigelow, a versatile man who could both understand code and fix a car. Bigelow's indispensable role in building the IAS computer brings up an important point; while von Neumann may have represented the very pinnacle of abstract thought, his computer wouldn't have gotten off the ground had Bigelow and his group of bright engineers not gotten their hands dirty. Great credit also goes to the two lead engineers on the ENIAC project, J. Presper Eckert and John Mauchly, who were rather unfairly relegated to the shadows and sidetracked by history. Dyson rightly places as much emphasis on discussing the nitty-gritty of the engineering hurdles behind the IAS computer as he does on its lofty mathematical underpinnings. He makes it clear that the ascendancy of a revolutionary technology requires both novel theoretical ideas as well as fine craftsmanship. Unfortunately in this case, the craftsmanship was ultimately trampled by the institute's mathematicians and humanists, which only added to its reputation as a refuge for ivory tower intellectuals who considered themselves above pedestrian concerns like engineering. At the end of the computing project the institute passed a resolution which forbade any kind of experimentation from ever taking place; perhaps keeping in line with his son's future interest in the topic, Freeman Dyson (who once worked on a nuclear spaceship and genuinely appreciates engineering details) was one of the few dissenting voices. But this was not before the IAS project spawned a variety of similar machines which partly underlie today's computing technology. All these accounts are supplemented with gripping stories about weather prediction, the US thermonuclear program, evolutionary biology, and the emigration of European intellectuals like Kurt Godel and von Neumann to the United States. The books does have its flaws though. For one thing it focuses too heavily on von Neumann and the IAS. Thus Dyson says relatively very little about Turing himself, about pioneering computing efforts at Manchester and Cambridge (the first stored-program computer in fact was the Manchester "Baby" machine) and about the equally seminal development of information theory by Claude Shannon. James Gleick's "The Information" and Andrew Hodges's "Alan Turing: The Enigma" might be useful complements to Dyson's volume. In addition, Dyson often meanders into one too many digressions that break the flow of the narrative; for instance, do we really need to know so much about Kurt Godel's difficulties in obtaining a visa? Notwithstanding these gripes, the book is beautifully written and exhaustively researched with copious quotes from the main characters. It's certainly the most detailed account of the IAS computer project that I have seen. If you want to know about the basic underpinnings of our digital universe, this is a great place to start even with its omissions. All the implications, pitfalls and possibilities of multiple scientific revolutions can be connected in one way or another to that little machine running quietly in a basement in Princeton.